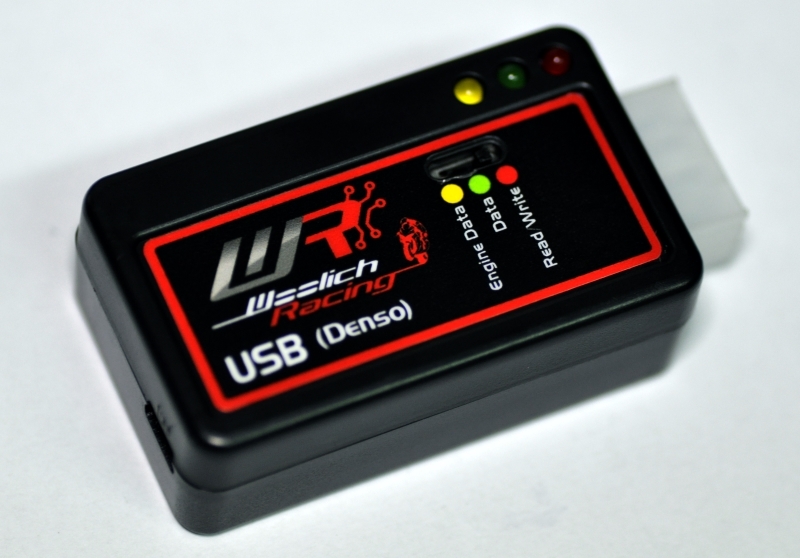 The USB (Denso) ECU Flashing Interface allows you to connect your computer to the Denso ECU in your motorcycle using a standard USB cable and a bike specific harness. 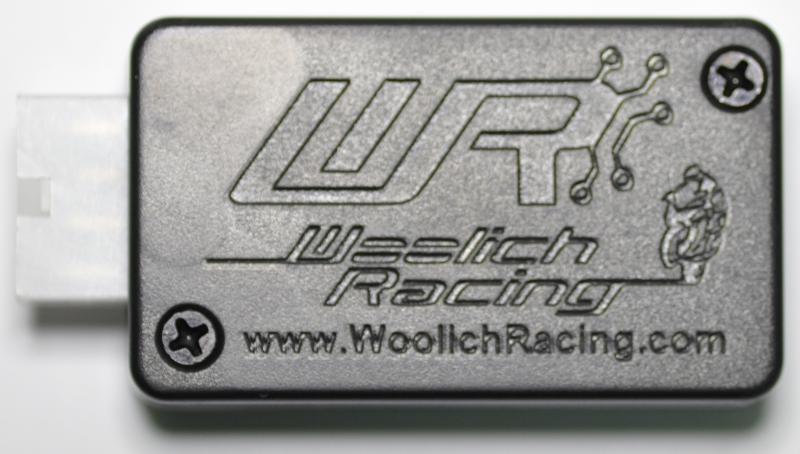 You can then use the Woolich Racing Tuned software to tune your bike and enable advanced functionality using your stock ECU. The Mitsubishi USB Interface also provides Engine Data mode to allow monitoring real time engine data directly from the ECU. The features available vary per bike model, you can view details of the maps and features available for your bike model on our Products page. 2002-2007 Suzuki Hayabusa - USB (Denso) v3 Package This package includes everything you need to start tuning your 2002-2007 Hayabusa with our USB Interface. 2003-2004 Suzuki GSX-R 1000 - USB (Denso) v3 Package This package includes everything you need to start tuning your 2003-2004 Suzuki GSX-R 1000 with our USB (Denso) v2. 2004-2005 Suzuki GSX-R 600 - USB (Denso) v3 Package This package includes everything you need to start tuning your 2004-2005 GSX-R 600 with our USB Interface. 2004-2005 Suzuki GSX-R 750 - USB (Denso) v3 Package This package includes everything you need to start tuning your 2004-2005 Suzuki GSX-R 750 with our USB Interface. 2005-2006 Kawasaki ZX6R - USB (Denso) v3 Package This package includes everything you need to start tuning your 2005-2006 Kawasaki ZX6R with our USB (Denso) v3 and On Bike Harness. 2005-2006 Kawasaki ZX6RR - USB (Denso) v3 Package This package includes everything you need to start tuning your 2005-2006 Kawasaki ZX6RR with our USB (Denso) v3 and On Bike Harness. 2005-2006 Suzuki GSX-R 1000 - USB (Denso) v3 Package This package includes everything you need to start tuning your 2005-2006 Suzuki GSX-R 1000 with our USB (Denso) v3. 2005-2008 Suzuki SV 1000 - USB (Denso) v3 Package This package includes everything you need to start tuning your 2005-2008 SV 1000 with our USB (Denso) v3. 2006-2007 Suzuki GSX-R 600 - USB Denso v3 Package This package includes everything you need to start tuning your 2006-2007 Suzuki GSX-R 600 with our USB (Denso) v3. 2006-2007 Suzuki GSX-R 750 - USB (Denso) v3 Package This package includes everything you need to start tuning your 2006-2007 GSX-R 750 with our USB (Denso) v3. 2006-2008 GSR 600 - USB (Denso) v3 Package This package includes everything you need to start tuning your 2006-2008 GSR 600 with our USB (Denso) v3. 2006-2008 Kawasaki ER-6n - USB (Denso) v3 Package This package includes everything you need to start tuning your 2006-2008 Kawasaki ER-6n with our Denso USB v3. Interface and Bench Harness. 2006-2008 Kawasaki EX650 / Ninja 650 - USB (Denso) v3 Package This package includes everything you need to start tuning your 2006-2008 Kawasaki EX650 / Ninja 650 with our USB (Denso) v3. and Bench Harness. 2006-2009 Suzuki M109R - USB (Denso) v3 Package This package includes everything you need to start tuning your 2006-2009 Suzuki M109R with our USB v3. Interface. 2007 Suzuki GSX-R 1000 - USB (Denso) v3 Package This package includes everything you need to start tuning your 2007 GSX-R 1000 with our USB (Denso) v3. 2007-2008 Kawasaki ZX6R - USB (Denso) v3 Package This package includes everything you need to start tuning your 2007-2008 Kawasaki ZX6R with our USB (Denso) v3 and On Bike Harness. 2007-2012 Suzuki B-King - USB (Denso) v3 Package This package includes everything you need to start tuning your bike with our USB v3. Interface. 2007-2010 Suzuki GSF 1250 (Bandit) - USB (Denso) v3 Package This package includes everything you need to start tuning your 2007-2010 GSF 1250 with our USB (Denso) v3. 2008 Suzuki GSX-R 1000 - USB (Denso) v3 Package This package includes everything you need to start tuning your 2008 GSX-R 1000 with our USB (Denso) v3. 2008-2010 Suzuki GSX-R 600 - USB (Denso) v3 Package This package includes everything you need to start tuning your 2008-2010 GSX-R 600 with our USB (Denso) v3. 2008-2010 Suzuki GSX-R 750 - USB (Denso) v3 Package This package includes everything you need to start tuning your 2008-2010 GSX-R 750 with our USB (Denso) v3. 2007-2010 Suzuki GSF 650 (Bandit) - USB (Denso) v3 Package This package includes everything you need to start tuning your 2007-2010 GSF 650 with our USB (Denso) v3. 2008-2012 Suzuki Hayabusa - USB (Denso) v3 Package This package includes everything you need to start tuning your 2008-2012 Hayabusa with our USB (Denso) v3. 2009-2012 Kawasaki ZX6R - USB (Denso) v3 Package This package includes everything you need to start tuning your 2009-2012 Kawasaki ZX6R with our USB (Denso) v3 and On Bike Harness. 2009-2010 GSR 600 - USB (Denso) v3 Package This package includes everything you need to start tuning your 2009-2010 GSR 600 with our USB v3. (Denso). 2009-2011 Suzuki GSX-R 1000 - USB (Denso) v3 Package This package includes everything you need to start tuning your 2009-2011 GSX-R 1000 with our USB (Denso) v3. 2010-2013 Kawasaki Z1000 - USB (Denso) v3 Package This package includes everything you need to start tuning your 2010-2013 Kawasaki Z1000 with our USB (Denso) v3. and Bench Harness. 2011 Suzuki GSX-R 600 - USB (Denso) v3 Package This package includes everything you need to start tuning your 2011 GSX-R 600 with our USB (Desno) v3. 2011 Suzuki GSX-R 750 - USB (Denso) v3 Package This package includes everything you need to start tuning your 2011 GSX-R 750 with our USB v3. Interface. 2011-2012 Suzuki GSR 750 - USB (Denso) v3 Package This package includes everything you need to start tuning your 2011-2012 Suzuki GSR 750 with our USB (Denso) v3. 2011-2013 Kawasaki Z1000SX / Ninja 1000 - USB (Denso) v3 Package This package includes everything you need to start tuning your 2011-2014 Kawasaki Z1000SX / Ninja 1000 with our USB (Denso) v3 and Bench Harness. 2012-2014 Suzuki GSX-R 1000 - USB (Denso) v2 Package This package includes everything you need to start tuning your 2012-2014 GSX-R 1000 with our USB (Denso) v2. 2012-2014 Suzuki GSX-R 600 - USB (Denso) v2 Package This package includes everything you need to start tuning your 2012-2014 GSX-R 600 with our USB (Denso) v2. 2012-2014 Suzuki GSX-R 750 - USB (Denso) v2 Package This package includes everything you need to start tuning your 2012-2014 GSX-R 750 with our USB Interface. 2013-2014 Kawasaki EX300 / Ninja 300 - USB (Denso) v2 Package This package includes everything you need to start tuning your 2013-2014 Kawasaki EX300 / Ninja 300 with our USB (Denso) and Bench Harness. 2013-2014 Kawasaki ZX6R (636) - USB (Denso) v2 Package This package includes everything you need to start tuning your 2013-2014 Kawasaki ZX6R (636) with our USB (Denso) v2 and On Bike Harness. 2013-2014 Suzuki Hayabusa - USB (Denso) v2 Package This package includes everything you need to start tuning your 2013-2014 Hayabusa with our USB (Denso) v2. 2008-2011 Yamaha YZF-R6 - USB (Denso) v3 Package This package includes everything you need to start tuning your 2008-2011 Yamaha YZF-R6 with our USB (Denso) v3 Interface. 2009-2010 Suzuki M109R - USB (Denso) v3 Package This package includes everything you need to start tuning your 2009-2010 Suzuki M109R with our USB v3. Interface. 2009-2011 Kawasaki ER-6n - USB (Denso) v3 Package This package includes everything you need to start tuning your 2009-2011 Kawasaki ER-6n with our USB (Denso) v3 and Bench Harness. 2009-2012 Kawasaki ZX6R KRT Race Kit ECU - USB (Denso) v3 Package This package includes everything you need to start tuning your 2009-2012 Kawasaki ZX6R KRT Race Kit ECU with our USB (Denso) v3 and On Bike Harness. 2012-2014 Kawasaki ER-6n - USB (Denso) v2 Package This package includes everything you need to start tuning your 2012-2014 Kawasaki ER-6n with our Denso USB Interface and Bench Harness. 2012-2014 Kawasaki Z800 - USB (Denso) v2 Package This package includes everything you need to start tuning your 2012-2014 Kawasaki Z800 with our USB (Denso) v2 and Bench Harness. 2015-2016 Kawasaki Versys 650 - USB (Denso) v3 Package This package includes everything you need to start tuning your 2015-2016 Kawasaki Versys 650 with our USB (Denso) v3 and On Bike Harness. The User Guide for the USB (Denso) v2 can be found on our User Guides and Installation Instructions page.